Hans Ørberg's Lingua Latina per se Illustrata is the world's premiere series for learning Latin via the Natural Method. The Natural Method encourages students to learn Latin without resorting to translation, but instead by teaching them to think in the language: students first learn grammar and vocabulary inductively through extended contextual reading and an ingenious system of marginal notes. 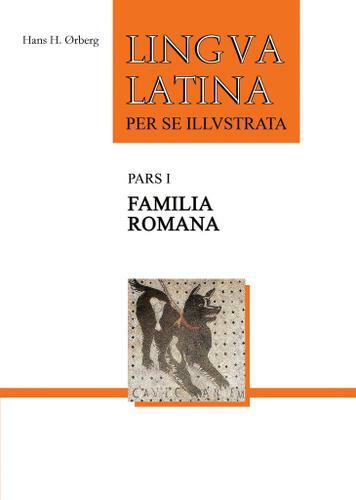 Lingua Latina per se Illustrata is also the most popular series for those teachers at both the secondary and collegiate levels who wish to develop Latin conversational skills in the classroom.Familia Romana (the main book of Pars I of the Lingua Latina per se illustrata series) contains thirty-five chapters and describes the life of a Roman family in the 2nd century A.D. It culminates in readings from classical poets and Donatus's Ars Grammatica, the standard Latin school text for a millennium. Each chapter is divided into two or three lessons (lectiones) of a few pages each followed by a grammar section (Grammatica Latina) and three exercises (Pensa). Hans Ørberg's impeccable Latin, humorous stories, and the Peer Lauritzen illustrations, reproduced in full color, make this work a classic. The book also includes a table of declensions, a Roman calendar, and a word index (index vocabulorum). The Lingua Latina series incorporates the following features:The most comprehensive treatment of Latin grammar available in an elementary textbook.A vocabulary of almost 1,800 words, reinforced by constant and creatively phrased repetition, vastly expands the potential for later sight reading.A complete line of ancillary volumes, exercises, and readers both in print and online.